A cheesy vegan garlic bread recipe made with vegan soy cheese and vegan mayonnaise for a dairy-free but still traditional vegan garlic bread. Perfect for a vegan barbecue or cookout. 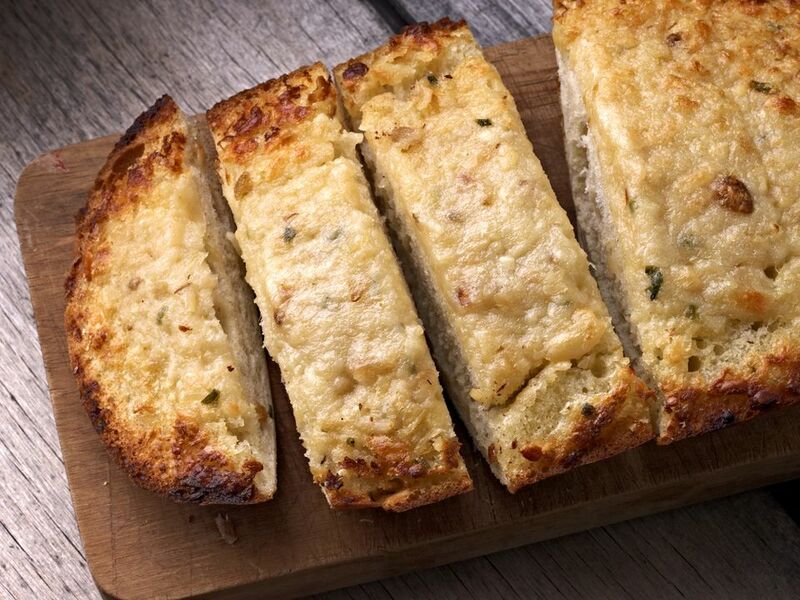 Cheesy vegan garlic bread recipe courtesy of Follow Your Heart Foods. Mix vegan mayo like Vegenaise, vegan cheese, onions, and garlic. Spread on bread halves. Sprinkle with parsley if desired. Wrap each half in foil. Refrigerate 1 to 2 hours or freeze. Unwrap and place on a baking sheet. Bake at 400 F for 8 to 10 minutes (20 to 25 minutes if frozen) or until puffed but not brown. Cut into slices. Vegan garlic bread can also be wrapped in foil and placed on the grill, just like regular garlic bread, if you're having a barbecue.